It’s not that I didn’t enjoy reading the book because I did. I enjoyed reading about the places that he visited and there were certainly plenty of pages when I had a wee smile to myself and nodded in agreement with Mr Bryson. I also enjoyed hearing about his previous travels to some of the towns and villages he visited and the funny things that happened to him. He has a very easy, entertaining style of writing and I always enjoy reading the more obscure stories which this author seems to unearth. He’s always very informative in his writing and never in a dry way. I just felt that he was turning into a bit of a grumpy old man in this book, which he would probably admit himself. 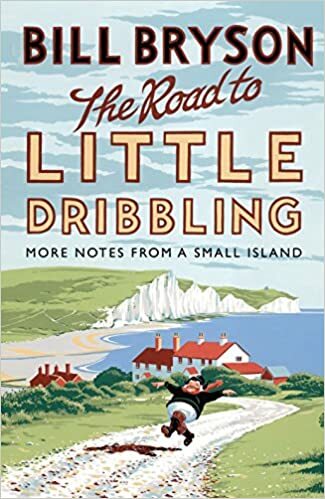 The Road to Little Dribbling is less of a tour of Britain than of a tour of England and mostly the South of England at that. Scotland barely gets a hurried chapter near the end of the book. Wales also merits just the one chapter and Northern Ireland doesn’t get a look in. I’d like to see Bill Bryson do one of his ramblings around Scotland so he could really do it justice. Or maybe I wouldn’t if he’s still going to be so grumpy! He does redeem himself at the end of the book though by explaining why he still loves Britain citing things like Boxing Day, country pubs and the quiet beauty of the countryside. I’ll allow him this one grumpy book and look forward to being entertained again with his next. Twenty years ago, Bill Bryson went on a trip around Britain to celebrate the green and kindly island that had become his adopted country. The hilarious book that resulted, Notes from a Small Island, was taken to the nation’s heart and became the bestselling travel book ever, and was also voted in a BBC poll the book that best represents Britain.Now, to mark the twentieth anniversary of that modern classic, Bryson makes a brand-new journey round Britain to see what has changed. Hmm. I wondered if the expectations for this one might be too high! Still a good read but there’s definitely more than a hint of grumpy old man about him! Oh no, I am so looking forward to this book. I have loved all his others. Still forewarned is forearmed. You are so right about the scenery in Cornwall and I love that photo, it’s impossible to think he could ignore that. It is still funny and entertaining, I just got fed up with the moans! Wouldn’t put me off reading more as I have always loved his books before. I love his books normally but not read this one yet!